Using pencil, draw twenty-four 1 1/2-inch circles on waxed paper-lined cookie sheets, 2 inches apart. In medium microwavable bowl, mix chocolate chips and candy coating. Microwave uncovered on Medium 3 to 4 minutes, stirring once halfway through. Stir until smooth. Spoon and spread 1 tablespoon chocolate mixture onto each circle. Refrigerate about 10 minutes or until chocolate is set. Place 12-inch piece of waxed paper on work surface. 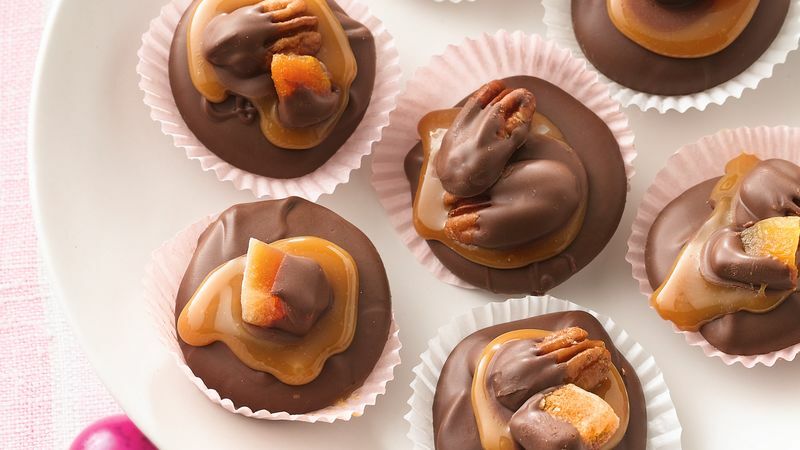 Dip fruit pieces and pecan halves into chocolate; place on waxed paper. In small microwavable bowl, microwave caramels and milk uncovered on Medium 2 1/2 to 3 minutes, stirring once every minute, until melted. Stir until smooth. Spoon about 1/2 teaspoon caramel mixture onto each chocolate circle, leaving 1/2 inch chocolate showing around edge. Decorate each with dried fruit or nut; press down lightly. Refrigerate just until set. Gently remove candies from waxed paper. Store in single layer in airtight container. Milk chocolate can be replaced with white, semisweet, bittersweet or dark chocolate. For range-top preparation, in heavy 2-quart saucepan, melt chocolate chips and candy coating over low heat, stirring constantly, until smooth. In 1-quart saucepan, melt caramels and milk over low heat, stirring constantly, until smooth.